It feels great to be a Manhattan Wedding Photographer! Set in the middle of the Big Apple and almost literally teeming with great sites and establishments, this beautiful borough isn’t just known for being the economic center of New York City, it also happens to be the historical womb from which the rest of Big Apple emerged. As such, it is a fantastic place to have your wedding and capture some of the brilliance that is the city that never sleeps. Just like Manhattan represents the genesis of New York and lives on as a glorious monument to how the city has come, so will your wedding represent the genesis to your married life. When you look back at your wedding pictures you won’t help but smile, seeing the glory in which it all started. I’m willing to bet looking at those photos will rekindle that spark every time. While the photos should be great, however, it’s imperative that they’re taken by a great photographer to begin with. Finding a great Manhattan Wedding Photographer is quite possible. In fact, the borough is full of them. To be honest, I’ve never seen a bad photo taken in Manhattan. However, despite this, you still need to go the extra mile if you want to get the best of the best. Once you have a clear idea of the kind of photography you’re after, you can start your search for the ideal photographer in earnest. The best way to tell if a photographer is good enough for your purposes is to talk to people he or she has worked for before. References are the best source of an honest review of a photographer’s work. The best place to start is, of course, the internet. You can go to popular photography review sites and look the photographers who’ve been features. Read a good number of their client reviews carefully and see what people think about them and their work. You can pay particular attention to the photographers who’ve been rated highly by most people. If their work also happens to be the type of work you’d like to see more of, then you’re in luck! There are lots of review sites where you can find Manhattan wedding photographers, so don’t just stick to one. A lot of the time you’ll find that a particular photographer has been rated on more than one site. You should have a look at their ratings across the board and see what people think on average. You’re probably going to come across a lot of good options as you explore and find references. You should compile a shortlist from these options, picking only the ones who checked most of your boxes. Also, be sure to pick photographers who have a style that matches your needs. There are a lot of good Manhattan wedding photographers out there, but not all of them will have a style that you want. Make sure your short list takes this into consideration. After you have a reasonable list of prospects, contact them each individually and organize a meeting in person. It probably seems like it’s going to be a lot of work, but it’s definitely going to be worth it. Make sure you get to know the photographer on a personal level. It’s just as important for you to know what makes them tick as it is for them to know what makes you tick. Be sure to have all the relevant information concerning your wedding as well. This is a great chance for you to explain to the photographer just what your dream wedding should look like. You’ll get a valuable opportunity to see how well they can see you vision. Make sure you also take this opportunity to delve deeper into the photographer’s work. By now, you’ve probably only seen a couple of photos of their work. Ask the photographer to come with an extensive and diverse album of their work so you can see how well they’ve been doing at the different weddings they have covered. There is always the possibility that the few good shots you saw of the photographer’s work were the best they’d ever taken and everything else is less than breathtaking. Make sure you get all the relevant information from the photographer concerning the service they offer. This includes their rates, the time it will take, the rights to the photo, how many photos you can expect, and whether they provide editing services with their photos. Once you’re done, you can finally choose whichever photographer works for you. Try to keep your decision as objective as possible. This photo was taken at the Manhattan Penthouse, which stands tall at the center of the Big Apple. From this coveted space, a Manhattan Wedding Photographer is privy to what has been boasted as being the best 360 degree views of any event hall in the city. The exceptional skyline views, a gorgeous interior space, and excellent service male the Manhattan Penthouse one of the top event venues in the area. The venue hosts a myriad events, including photo shoots, brainstorming workshops, corporate events, birthdays, anniversaries, and wedding receptions, of course. This photograph shows the groom of this Penthouse wedding celebration preparing for the day and looking out at the spectacular Manhattan skyline view. The expression on the groom’s face is candid and full of joy as he gazes steadily out the window. Light streams in, illuminating his already brilliant smile. It is a genuine smile that reaches his wise eyes and shines out of them in an almost childlike wonder. The groom is not only amazed by the scene before him, but also by the fact that he will soon be marrying his best friend, the woman of his dreams. Colors in this photo are simple, keeping attention on the face of the groom and his expression during the moment. 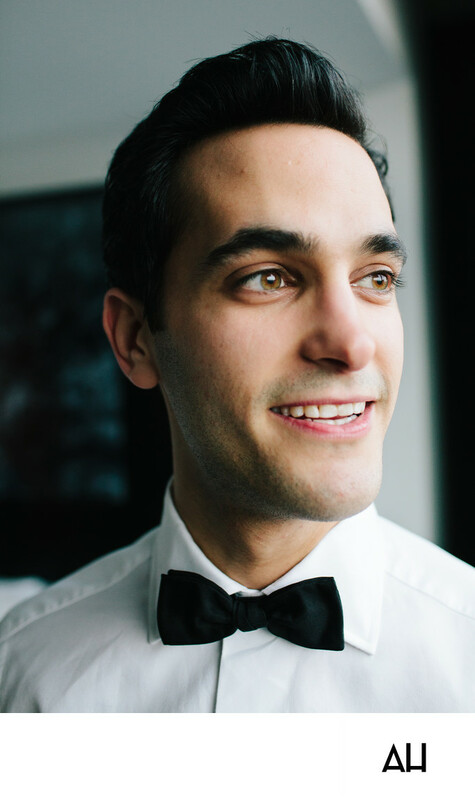 The stark contrast of the white shirt, black tie, and the groom’s dark hair, along with the black and white setting behind him, draw focus to his eyes and his easy smile. He has been waiting for this day since the second he met his bride, and now it is finally here.